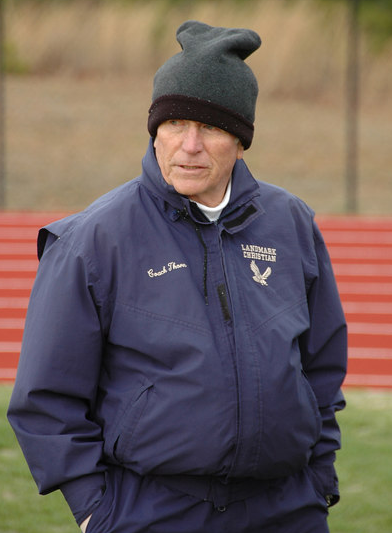 Bill Thorn is arguably the best high school Track and Field coach in the Southeast and hands-down the best in Georgia. I ran for Coach Thorn in high school and he was, for many years, "the thorn in my side." I always thought him as a mean, crusty, old man, but he just wanted the best for his team and to see people succeed athletically. He would never let you quit and made you push your body's limits to the max. His battle cry was "given time, hard work beats talent." And that very maxim rang true in his own life. When Coach Thorn developed cancer, instead of submitting to chemotherapy, he of course chose to run it out. At 77 years old, he's the only runner to complete every single Peachtree Road Race since it's inception in 1978. "The Peachtree" as it's known to the locals, is the world's largest 10-K race. At Landmark Christian School, my alma mater, Coach Thorn led the track team to an amazing 7 consecutive state titles ('96-'02).